Enchanting and secluded beaches, a bit of history, plenty of sun and sea, tranquil surroundings, virtually untouched jungles and amazing local food to savor - this is what makes Pulau Pangkor an idyllic getaway. Though relatively small, Pulau Pangkor has everything to offer for tourists who come with different expectations. Check out attractions of Pulau Pangkor and decide when to go, where to stay and how to spend your holiday on this beautiful island. Pulau Pangkor is located between Penang and Kuala Lumpur. It is a small island with total area of only 8 kms. Yet, the fishing villages, the bustling towns and world-class holiday resorts don't jostle for space. Sun, surf and sand contribute to making your stay at Pulau Pangkor a carefree and relaxing holiday. Two days at Pulau Pangkor would suffice to explore and experience the beauty of the island. For many tourists, it's usually a stopover destination while waiting to travel to another place. Many combine vacationing at Kuala Lumpur with a day trip to Pulau Pangkor. 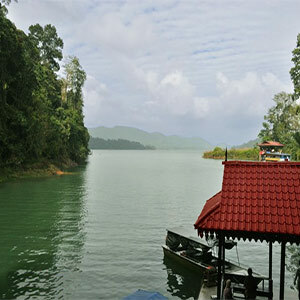 By road : For those driving from Kuala Lumpur to Pangkor Island (Pulau Pangkor), the entry point to Pulau Pangkor is the nearest town known as Lumut. Make use of a road map and enjoy the journey along the palm-lined coasts, which is approximately 280 km taking around 4 hours. The other option is using buses, which ply from many parts of Malaysia to Lumut bus station, which is located opposite Lumut jetty. Ferry services : A scheduled ferry service from Lumut town is available to and from the island. Pangkor is a 15-minute ferry ride from Lumut. Check ferry timings for respective resorts before departure. Going around: Public transport system is not available in Pulau Pangkor. The island circle road is narrow and often steep making it slightly difficult to go around bicycling. But the advantage is the possibility of visiting unusual places. Accommodation options : There is a good range of accommodation options in Pulau Pangkor. You can choose from luxury accommodations, mid-market hotels and budget cabanas to resort style hotels that provide international standard facilities. For tourists on tight budgets, there are cheap guesthouses and beach huts. Best time to go: It's a laid back place but with heavy inflow of tourist, Pulau Pangkor can get crowded, especially during weekends and public holidays. If you are keen on enjoying an idyllic vacation, it is best to visit during the week. Weather is hot and humid whole year around. And Pangkor doesn't experience monsoon season. Visit beaches: The pristine and quiet beaches are the most famous attractions of Pulau Pangkor. A favorite pastime for tourists is basking in the sun on the golden brown sandy beaches and watching fishing boats rocking gently on calm blue waters. Pasir Bogak, Teluk Nipah, Teluk Belanga, Coral Bay are some of the beaches of Pulau Pangkor. Teluk Nipah beach is the biggest beach on the island. Teluk Nipah Beach is attractive, with several hundred meters stretch of white sand with little current and warm water making it comfortable and enjoyable for swimmers. It isn't very deep. Pasir Bogak beach is also famous. You can experience banana boating, fishing trip, jet-ski, kayak and scuba diving and snorkeling. During low tide, tourists can walk to Pulau Giam, an island in front of the beach. You can hire a boat to visit the nearby islands. For best snorkeling experience, visit Pulau Giam and Pulau Mentaggor islands. Kayaks are available on rent for paddling to these islands. Savor local cuisine: Malaysia is a foodie's delight. Malaysian food is a fusion of Indian, Chinese, Thai and Malay cuisine. Malaysian islands offer incredible choice of sea food. Good food can be found especially at Teluk Nipah. There are food stalls near the two little side streets at Nipay bay or Teleuk Nipah Beach. Savor local delicacies like noodle and rice dishes and other specialties like barbecue fish, squid and shrimps. Try a full meal of rice, vegetables in coconut milk and spices, with beef and chili squid. Retreat to jungles : For a closer look at nature, to explore the wilderness, plan a retreat into the virgin jungles of Pulau Pangkor and experience the unspoilt natural splendor. As you trek through the primitive rain forest at Titi Gantung and Teluk Segadas, feast your eyes on spectacular scenery, fast flowing streams, waterfalls and dense rainforest. Visit the Pangkor forest reserve. It is home to rare orchids, colorful birds, butterflies and monkeys. Explore the fishing villages: Villagers live in scattered fishing settlements along the coast on the eastern side. Visit the fishing village and watch the fishermen return with the catch, mainly cuttlefish and anchovy. Visit two main factories that produce most of the sea products sold on Pangkor Island. To buy souvenirs crafted from seashells and local materials, go to the Pulau Pangkor jetty. A bit of history: The history of the Dutch Fort is one of the interesting parts of Malaysian history. Local Malaysians call the Dutch Fort on Pangkor Island as Kota Belanda. The fort was built in 1670. It is located at Teluk Gedung, just south of Pangkor Town on the South West part of the island. Dutch Fort became a historical monument under the Antiquities Act in 1976.